Methimazole treats hyperthyroidism in cats, a condition in which too much thyroid hormone is produced. Uses: Cats: Methimazole reduces the amount of thyroid hormone produced by the body. It is used to treat hyperthyroidism, a condition in which too much thyroid hormone is produced. It will not cure the disease, but will usually control it if given for the rest of the cats life. 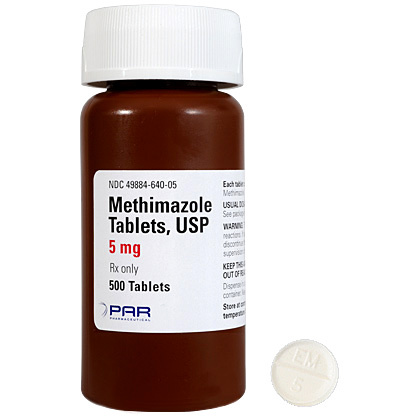 Dogs: Methimazole may be used to protect the kidneys in dogs receiving cisplatin, an anti-cancer drug.